Sacramento Kings rookie forward Ben McLemore learned the hard way that when LeBron James is driving to the basket and has a chance to dunk, trying to draw a charge isn’t the best method of defense. The Miami Heat superstar threw down a monster dunk over McLemore in Friday’s Kings-Heat game in Miami, and it wouldn’t be surprising to find it on a poster one day. As one of the NBA’s best dunkers, it would be nice to see James compete in the Slam Dunk Contest during All-Star Weekend, but that’s a story for another day. 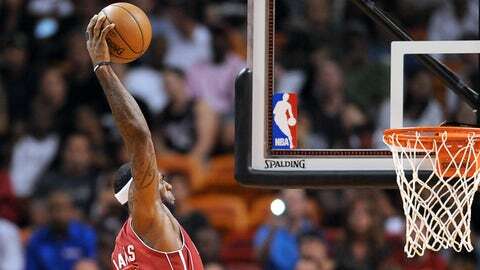 Check out the dunk of the year candidate in the video below.